Fresno is fifth-largest city in California, the largest that’s not on the coast, and the largest in the Central Valley, that agricultural cornucopia that’s being destroyed by drought and environmentalist idiocies. Anyway, just by its position and population Fresno is important to the state’s economy, particularly our agricultural sector. (Where do you think your raisins come from?) But, like much of the Central Valley, it’s suffered more than the rest of California from the 2008 recession and the pathetic recovery: unemployment in the Fresno area in 2014 was still over 11%, well above California’s statewide average of 7.1% at the end of that year. So, when your city is suffering from a lack of jobs, what’s the first thing you think of to increase opportunities for work? That’s right! You demand an increase to the cost of labor! On Wednesday, according to the Fresno Bee, over 150 people joined other workers around the country marking Tax Day by marching in rallies organized by unions as they demanded the current federal minimum wage of $7.24 an hour be raised, as well as the California $9 minimum wage. In other words, when government raises the cost of doing business —and labor is a cost!— business owners have just a few choices: pass the cost to the consumer and risk losing their custom; reduce profits to perhaps unacceptably low levels; reduce labor costs by cutting back hours, letting people go, and not hiring; or just getting out of the business. They’re already learning this in progressive Seattle, and it looks like the Fresno McDonald’s workers understand basic economics, too, unlike SEIU. Or maybe SEIU just doesn’t care that fast food workers can be replaced with kiosks, as long as they themselves get their cut. Either way, they’re not helping Fresno county’s unemployment problem. Due to the new increased minimum wage law in San Francisco, a beloved bookstore and mainstay of the Mission District has been forced to close its doors for good. The minimum wage for San Francisco workers, currently at $11.05 an hour, soars to $15 an hour in July 2018. The store’s projected labor costs, reported ABC7 News, impelled Borderlands Bookstore to write its final chapter. In November, San Francisco voters overwhelmingly passed a measure that will increase the minimum wage within the city to $15 per hour by 2018. Although all of us at Borderlands support the concept of a living wage in principal and we believe that it’s possible that the new law will be good for San Francisco — Borderlands Books as it exists is not a financially viable business if subject to that minimum wage. Consequently we will be closing our doors no later than March 31st. Evidently Mr. Vallecillo and the other voters of the Special City were asleep during their economics lessons — assuming that’s even taught anymore. Let’s review, shall we? In a functioning, literate polity that teaches its young fundamental lessons of civics and economics, an informed electorate could have looked at that proposal and said, “Nah, that’s going too far.” Instead, we have voters who feel good about themselves for voting themselves more consequence-free stuff, and then feel sad when the consequences arrive. Maybe they’ll learn something from the experience. RELATED: This isn’t the first time we’ve seen the consequences of ill-thought policy regarding the minimum wage. Seattle voted a high minimum, and now businesses are considering leaving. Some companies are considering replacing now-expensive minimum-wage workers with computerized kiosks. Los Angeles wants to raise the minimum to $13.25. Can’t wait to see how many entry-level jobs are lost thanks to that, or how many low-skill young workers looking for their first job are priced out of the market because of it. More from Ron Radosh, and more posts on the minimum wage. That favorite coffee shop that you go to? That great neighborhood restaurant? That store where you buy your books, pet food, art supplies, or clothes? Each of those businesses survives on around a 5 percent net profit margin. That means that at the end of the year, after all the expenses—the payroll, the supplies, the inventory, insurance, rent, etc.—we all will end up with only about 5 percent income in our pockets if we’re doing a half-decent job. Maybe a bit more, maybe a bit less—but you get the idea. This does not leave a small local business with much room to absorb even a small increase in costs, much less the 60 percent increase demanded by the well-meaning but ill-researched and biased reporters and neighbors involved in this discussion. Payroll is approximately 30 percent of my entire costs at Liberty, the bar I own (the average in this business seems to be 30 to 35 percent). If the minimum wage goes up to $12.50 an hour (a reasonable middle ground some have proposed), that would be an increase of 34 percent, which means just to stay even I’d have to raise prices 10 percent across the board—the labor’s percentage increase in total cost to operate Liberty. If the minimum wage goes to $15 an hour, I’d have to raise my contribution to payroll by 18 percent. So my costs would have to rise by no less than 18 percent, just for payroll—and that’s before my vendors’ increases in costs have to be considered, which I believe will be around another 5 percent, and that’s before Liberty adds any profit. So it’s not impossible to imagine that costs for business like mine in Seattle will go up by no less than 20 percent. Those increases are way more than my income. Again, my profit is around 5 percent. And it’s not just me, that’s across the board—for restaurants, for bars, for clothing stores, for pet stores, for art supply stores—many of whom have set costs and are competing with online retail. This makes it very difficult for them to adjust their purchasing. So, what are this business owner’s options? That’s his problem, not the Seattle city council’s. Thomas Sowell has often observed that politicians almost never feel the economic consequences of the decisions they force on the rest of us. While they’re buying their way to reelection by handing out goodies and making themselves feel good by supposedly “fighting for the people,” someone else has to pay the cost — in this case, the businessman who takes less profit, the worker who gets fewer hours, or the consumer who pays higher prices. A friend supervises minimum wage, hourly employees in an educational setting. Our minimum wage [in California] has just gone up to $9 per hour. She has told me that she knows for a fact her budget for hiring will not increase, so she has to cut employee hours and, perhaps, eliminate a couple of jobs. Now, someone explain to me again how this increase actually helped these workers? But it sure made the pols in Sacramento feel good about themselves. I wrote about this last week, when it was still just a proposal, noting how some businesses were already slowing hiring and moving out of the city, and how even progressives were coming to have second thoughts. Seattle’s city council on Monday unanimously approved an increase in the city’s minimum wage to $15 an hour, making it the nation’s highest by far. Washington already has the nation’s highest state-level minimum wage, at $9.32. That rate also applies to the city. While the law phases in increases starting only with “large businesses,” that designation includes franchises. In other words, if you’re a franchisee with only a couple of Taco Bells, you’re still considered a large employer because you’re part of a large chain; even though your revenue only comes from two locations, you’re still on the hook for $15 per hour starting in 2017. You’re welcome. This is going to be a good experiment (and, dare I say it? A “teachable moment?”) for several reasons. Advocates of raising the wage say it’s only fair, that minimum wage earners aren’t paid enough to live on, and that the costs to society will be minimal as businesses adjust. And there is some little evidence for the latter, as we have indeed learned to live with the costs previous minimum wage increases. (Whether those wage increases have been worth the costs, however, is another argument for another time.) Advocates in Seattle argue that raising the wage will help around 100,000 people. Critics, on the other hand (and including your humble correspondent), argue that the laws of economics cannot be repealed by legislative fiat: raise the cost of labor, and businesses will be faced with a choice from among four options — pass the costs on to the consumer; reduce labor costs by cutting hours or whole jobs; eat the costs and accept lower profits; or cease doing business in that jurisdiction, either by moving or closing shop. We’ve already seen in the Seattle case that some businesses are moving to nearby towns that have not raised their wage. And, here in California, where the wage was recently raised to $9 per our and there is a proposal to raise it statewide to $13, some businesses are closing, choosing to put their capital to work where they can get a better return on investment. In each case, these are jobs lost. And that’s exactly what happened when the minimum wage rose by 41% between 2007 and 2009 – it had a disastrous effect on teenagers. The jobless rate for 16-19 year olds increased by ten percentage points, from about 16% in 2007 to more than 26% in 2009. Of course, the overall US jobless rate was increasing at the same time, from about 5% to 10%. Therefore, the graph attempts to better isolate the effects of the minimum wage increases between 2007 and 2009 on teenagers by plotting the difference between the teenage jobless rate and the overall jobless rate, i.e. “excess teen unemployment,” and the minimum wage. During the 2002-2007 period when the minimum wage was $5.15 per hour, teenage unemployment exceeded the national jobless rate by about 11% on average. Each of the three minimum wage increases was accompanied by a 2 percentage point increase in the amount that the teenage jobless rate exceeded the overall rate, from 11 to 13% after the 2007 increase from $5.15 to $5.85 per hour, from 13% to 15% following the second hike to $6.55 per hour, and from 15% to 17% following the last increase to $7.25. The 17.5% “excess teen unemployment” in October 2009 was the highest on record, going back to at least 1972, and was almost 5 percent higher than the peak teen jobless rate gap following the last recession (12.7% in June 2003). It will be interesting and edifying how Seattle’s experiment in progressive labor law plays out. I suspect it won’t have nearly the benefit that advocates like Seattle Mayor Murray or California State Senator Leno predict. And it’s a shame others have to suffer for their hubris. RELATED: This Center for Freedom and Prosperity video provides a good overview of why minimum wage laws are job killers. SB 935, as amended, Leno. 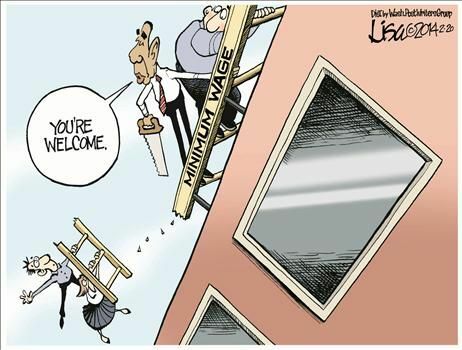 Minimum wage: annual adjustment. Existing law requires that, on and after July 1, 2014, the minimum wage for all industries be not less than $9 per hour. Existing law further increases the minimum wage, on and after January 1, 2016, to not less than $10 per hour. This bill would increase the minimum wage, on and after January 1, 2015, to not less than $11 per hour, on and after January 1, 2016, to not less than $12 per hour, and on and after January 1, 2017, to not less than $13 per hour. The bill would require the automatic adjustment of the minimum wage annually thereafter, to maintain employee purchasing power diminished by the rate of inflation during the previous year. The adjustment would be calculated using the California Consumer Price Index, as specified. The bill would prohibit the Industrial Welfare Commission (IWC) from reducing the minimum wage and from adjusting the minimum wage if the average percentage of inflation for the previous year was negative. The bill would require the IWC to publicize the automatically adjusted minimum wage. The bill would provide that its provisions not be construed to preclude the IWC from increasing the minimum wage to an amount greater than the calculation would provide or to preclude or supersede an increase of the minimum wage that is greater than the state minimum wage by any local government or tribal government. The bill would apply to all industries, including public and private employment. CKE Restaurants’ roots began in California roughly seven decades ago, but you won’t see the parent company of Carl’s Jr. and Hardee’s expanding there much anymore. What’s causing what company CEO Andy Puzder describes as “very little growth” in the state? In part it’s because “the minimum wage is so high so it’s harder to come up with profitable business models,” Puzder said in an interview. The state’s minimum wage is set to rise to $9 in July, making it among the nation’s highest, and $10 by January 2016. In cities in other states where the minimum wage has gone up considerably, Puzder said “franchisees are closing locations” after riding out lease expirations. If the federal minimum hourly pay shoots up to $10.10 from the current $7.25—as many lawmakers and President Barack Obama are advocating—Puzder predicts fewer entry-level jobs will be created. If this happens, CKE would also create fewer positions, he forecast. A recent nonpartisan Congressional Budget Office study also predicted mass job losses, estimating that a hike to $10.10 could result in a loss of about half a million jobs by late 2016, even as it lifted many above the poverty line. Minimum-wage jobs are not meant to be lifelong careers. For people just entering the labor market, they’re ways to acquire skills needed to move on to better-paying jobs. For others, they’re a means to bring in additional, supplementary income into the household. The pro-increase arguments distort facts and wrap them in myth, all to disguise what is really a wealth redistribution program. CKE’s Puzder goes on to relate how, when minimum wage increases are combined with the added expenses imposed by Obamacare, franchisees have chosen not to open new restaurants or have even closed locations, meaning these are jobs lost. But they do it because they can get a better return on their investment money elsewhere, such as by putting it in bonds. It’s called economic common sense, something Senator Leno and his colleagues are woefully lacking in. PS: SB 935 has now gone to the Assembly, and I will be shocked if it doesn’t pass. It’s frightening to think we have to rely on Governor Brown to be the sane one in the room and veto this bill when it shows up on his desk. I came across an interesting blog post from a few weeks ago while trolling the news this morning for something interesting. Now, we all know about the racist history of the Democratic Party: the defense of slavery, even inciting a civil war to preserve it; the creation of terrorist organizations, such as the KKK, in order to keep Blacks from exercising their rights as free citizens; and the creation of Jim Crow, which created a legal framework for Blacks’ oppression that lasted into the 1960s. “In 1925, a minimum-wage law was passed in the Canadian province of British Columbia, with the intent and effect of pricing Japanese immigrants out of jobs in the lumbering industry. A Harvard professor of that era referred approvingly to Australia’s minimum wage law as a means to “protect the white Australian’s standard of living from the invidious competition of the colored races, particularly of the Chinese” who were willing to work for less. Or cut employee hours or reduce the number of jobs to compensate for higher costs. The first two are very unlikely to happen, which leaves passing on the cost to the consumer or cutting back on labor. And if the owners decide to cut back on labor, guess whose hours get the ax first? That’s right, it’s most likely the lower or unskilled employee, because it makes less sense to pay them the higher wage when you have more skilled employees who give more value in return for their wages. Now, just who makes up a large percentage of that at-risk labor force? That’s right: young Blacks. The next time you encounter some Lefty blathering about raising the minimum wage, ask them why they have it in for young people and Blacks. Democrats and their Leftist allies are desperate to find any issue to run on in the coming elections, other than Obamacare. One of their tactics has been to try to gin up class warfare based on raising the minimum wage. They argue that it will help the poor, raise living standards, and, of course, be more “fair.” Republicans, conservatives, and libertarians, on the other hand, contend that increasing the cost of labor will only mean higher prices to the consumer, fewer jobs for the marginally skilled, and be particularly harmful to minorities. This video is a good example of how minimum wage laws kill jobs. Obama’s order does not take effect until January 1, 2015. But there are signs it is already having an effect — and it is not what the president and his party said it would be. The administration is making it very expensive to do business on military bases, and not just because of the minimum wage. Under federal contracting law, some businesses operating on military installations must also pay their workers something called a health and welfare payment, which last year was $2.56 an hour but which the administration has now raised to $3.81 an hour. As I wrote above, the natural business response to this is to either raise prices for the consumer, or cut back on employee hours — or cut jobs altogether. Well, guess what? York reports that military contracts do not allow the businesses to raise their prices above what’s common in the outside community. So, even though Obama is raising wages well above the prevailing standard, employers are forbidden to recoup their costs. What does that leave? If there’s no chance for profit, why stay open? When you add up the numbers for all four major services, we’re looking at potentially 10,000 jobs going up in smoke. Not to mention the ripple effect in the outside communities. Here we have a current, ongoing example of how raising the minimum wage harms people by killing jobs. (3) How then, is the Democratic proposal a good idea? (1) Thus excluding Democratic pols and activists. (3) Yes, military contract law made the situation worse by forbidding compensatory price increases. So, increasing costs for the consumer –including minimum wage earners!– is a good thing? And what’s to say the Obama administration, if they got their way on the minimum wage, wouldn’t try to extend price controls when the inevitable complaints arose? We are talking dyed-in-the-wool statists, after all. One bad policy, raising the minimum wage, inevitably leads to more bad policy. Just look at the history to-date of Obamacare. Weird, isn’t it? If having the state mandate higher and higher wages for everyone is such a good idea, why on Earth would WV House Democrats vote to exempt themselves from a law being imposed on everyone else? Last week, the Democrat controlled House in West Virginia passed legislation raising the state’s minimum wage to $8.75 an hour, $1.50 higher than the federal minimum wage. The action is part of a nation-wide effort by Democrats to make a minimum wage increase central to their platform for the midterm elections. The increase didn’t effect all workers, though. Democrats exempted many of their own staff from the wage hike. Businesses may have to pay the higher wages, but the legislature will avoid many of the consequences. Why, it’s almost as if West Virginia Democrats didn’t believe in private what they were preaching in public. But we all know that can’t be. The only people who truly benefit from minimum wage increases are union bosses, who salivate at the prospect of more dues coming in, money they can use to buy legislators. If I banged my head against the wall every time politicians advocated bad policy in Washington – which is a tempting impulse, I would have been institutionalized because of brain damage a long time ago. But it’s difficult to maintain my self control when I think about minimum wage laws. All sentient human beings should know higher minimum wage laws will mean more unemployment. Just ask them, for instance, what would happen if the minimum wage was raised to $100 per hour. Once they admit that would lead to massive job losses, they’ve accepted the principle and it’s simply an empirical issue of figuring out how many jobs are lost when the minimum wage is $75, $50, $20, $10, $6, etc. Go ahead, increase the minimum wage. Then, kiss those jobs goodbye. I’ve said time and again that because wages are a cost for businesses, they have to find a way to control them so they can earn a profit that makes it worthwhile to stay in business. Mandate wages that are too high, and companies will find creative ways to trim those costs back down. Fast food doesn’t have to have a negative connotation anymore. With our technology, a restaurant can offer gourmet quality burgers at fast food prices. Our alpha machine frees up all of the hamburger line cooks in a restaurant. It slices toppings like tomatoes and pickles immediately before it places the slice onto your burger, giving you the freshest burger possible. Our next revision will offer custom meat grinds for every single customer. Want a patty with 1/3 pork and 2/3 bison ground to order? No problem. Also, our next revision will use gourmet cooking techniques never before used in a fast food restaurant, giving the patty the perfect char but keeping in all the juices. It’s more consistent, more sanitary, and can produce ~360 hamburgers per hour. The labor savings allow a restaurant to spend approximately twice as much on high quality ingredients and the gourmet cooking techniques make the ingredients taste that much better. That’s from the web site of Momentum Machines in San Francisco. You can bet all those progressive Bay Area burger-flippers and baristas demanding a $15 per hour minimum wage will be screaming “unfair!” when they find themselves replaced. Not that I’m some sort of anti-technological Luddite; far from it. But these idio… er, “people” demanding a huge increase in the minimum wage need to recognize that their bosses have choices to make, and one of those choices may well be a very rational decision to cut back hours or eliminate jobs altogether. Is it worth winning a $15 per hour rate, when you wind up collecting nothing? Keep it up, burger flippers, and you may well pave the way for the return of the automat. For workers with no real skills, for example, teenagers just entering the job market, a high minimum wage makes them not worth what the employer is required to pay them. Minimum wages disproportionately hurt minorities, who often come from poor environments. Even if they’re willing to work to learn skill and prove themselves, the high minimum wage locks them out of the market. A minimum wage makes some sense as a floor if it’s beneath the prevailing market wage, but a minimum wage higher than that inevitably leads to higher unemployment as the cost of labor gets beyond what an employer can afford. Businesses aren’t charities. If a worker costs more than the revenue he generates, the employer won’t hire him. I can’t imagine we’ll ever see a rollback or elimination of the minimum wage, however. Then again, these are not normal times and, with so many people unemployed, perhaps enough people can be convinced. You have searched the Public Secrets blog archives for ‘minimum wage’. If you are unable to find anything in these search results, you can try one of these links.